Being an artist is not what it used to be. Long ago it was learning how to paint, draw, or sculpt. We all can recognize how much work goes into that sort of labor, and not just anyone can do it well. However, the integration of technology into our world has changed everything, and while we still see art coming out in those traditional mediums, there is a lot of digital art. Making digital art can be done in any fashion, but the better your equipment, the easier it is to do your job. It’s the same as having two paintbrushes to complete a painting. It’s possible, but harder. If you often draw, but need your work to be on a digital format, then it’s easier to use a tablet. We’ve seen a plethora of them in the past, and there will only be more in the future. However, tablets are often just a drawing space, and you have to be a good judge of your relation of the pen on the tablet to the position it takes on the screen. 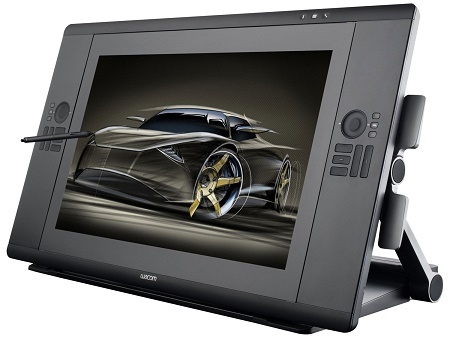 If you wish you could draw directly on your monitor, you’ll likely drool all over this Wacom Cintiq 24HD Graphic Monitor. This has a 24” LCD screen that has a resolution of 1920×1200. There are express keys that you can program along the border, and all of the screen that you see is your workable drawing area. You will need to make sure that you keep it clean as the oil from your hands will build up over time, making it possible to scratch the surface with your pen. This is as hefty in weight as it is in price, as this weighs in around 60 or more pounds, and costs anywhere from $1,800-3,700+. It will forever change your graphic design, illustrator, animator, or any other digital drawing work forever.